I'm choosing to focus on one word rather than a list this year because it feels more attainable, more life changing - not to be dramatic. Lists are easy to ignore, to feel defeated and to give up on. I can do one thing everyday. The story behind why I chose this word is over here, Breathe. Do you have One Word to Focus on for 2013? Share it with us today! 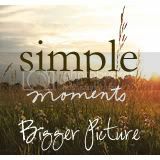 Simply sharing One Word, that’s my Simple Moment, Bigger Picture this week. What’s yours? Link up yours at Alita's this week. That picture is just beautiful! She does such good work. Love that word. Breathe is such a good word. May you have the space and desire to breathe each and every single day, Mel.